Dance for Health is 10:30 to 11:30 a.m. every Saturday between March 16 and May 11, 2019 (excluding April 20) at the Ralston Center (3615 Chestnut Street). Dance for Health is open to all adults 55 or older. RSVP by emailing tjcasey@upenn.edu or calling 215-898-9979. There’s a dance people do when they start listening to music and are getting a feel for it. Some people sway back and forth, others bob their head. On a Saturday morning, David Earley did both as he waited for the class participants to arrive. Wearing a coordinated outfit of all-white Nike Air Force shoes, black jeans, a white and red jersey with the words “you’re in good hands,” and a red baseball cap, Earley set up his small gray boombox at the front of the room and began playing “Same Ole 2step” by Ent Distrikt. The music was a cue for everyone in the room to get up and start dancing. Earley, along with his wife, Selena Williams, teaches this weekly dance class by putting together line dances that combine a series of simple steps with movements tailored for older adults. The duo have been teaching this class at the Ralston Center since it was brought here a few years ago. The couple also teaches other dance classes throughout the Philadelphia area. Dance for Health: Active Mind, Active Body is a Penn Memory Center (PMC) program held at the Ralston Center to promote healthy living for older adults through exercising, socializing, and healthy eating. The program involves joining weekly dance sessions and monthly intergenerational activities with students from an area high school, and completing a survey that measures participants’ well-being and satisfaction with their everyday lives both at the beginning and end of each session. The program was originally started by Dr. Terri Lipman of Penn Nursing. She started the program in 2013 as one of 11 initiatives in the Community Champions Program. As a memory center, PMC is committed to promoting healthy living among older adults in the local community, and the Dance for Health program is one way PMC does this. It’s been shown through studies that maintaining a regular schedule of exercise is a great way to maintain brain health. It helps reduce the risk of developing cognitive impairments due to neurodegenerative disease like Alzheimer’s disease and vascular dementia. Having a dance class at PMC also offers another way people affected by progressive memory problems can seek support. 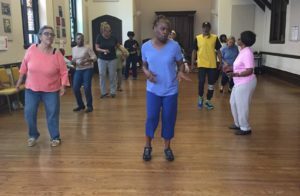 “Promoting brain health through dance with older adults in the West Philadelphia area is a great way for us to invite more people into the PMC community and give back,” said Karletta Poland, PMC coordinator for diversity in research and education. At Dance for Health, participants are encouraged to wear comfortable clothing, because once you enter the class, you’re going to be up and moving. Between Earlyey’s ad libbing and the upbeat songs, it would be hard for someone to attend the class and not join in. Mildred Johnson, who has been attending dance classes like Dance for Health for over eight years, said she joined the class to continue being healthy and live a good lifestyle. She heard about the class through word of mouth. What she likes most about it are the instructors and how they teach the class in a way that makes it easy for her to keep up and follow along. Johnson attends other dance classes throughout the week, some that are not specifically for older adults, so they may be more advanced in movement. She won’t participate at these classes, but she still goes for the experience. Dance for Health instructors take into account that the participants are older adults and may have some level of cognitive impairment and structure the class to allow everyone to join in. Participants have bonded and formed close friendships from frequently participating. One duo in particular, Diann White and Jakki Brown, are the life of the class. Both ladies love music and dancing, which is evident in one or both of them being the first people to get on the dance floor and last people to leave. They even got their own nickname, the Color Sisters, because of their last names. Brown, unlike many of the other participants, is not retired and still works during the week and just attends the class on the weekends, but White uses the class to stay active in retirement. “When you are retired, you have to find things to do to stay busy,” White said. Each class the participants will start with some dance numbers they already know, always with Earley or Williams joining and talking through the steps. The instructors will then introduce new choreography as they go, each dance number being simple and short enough that the participants can join in at any time. The classes are open to members of the PMC community who have normal cognition, mild cognitive impairment (MCI), and early stages of Alzheimer’s disease. The classes run for a few months at a time and meet once weekly. The program also incorporates University of Pennsylvania Master’s in Public Health (MPH) students. There is one student per session, who attends the Saturday classes, signs in the participants, engages with them during the class, and keeps track of the pedometers that track their steps. Danielle Kennedy was the MPH student this past spring, and she graduated from University of Pennsylvania this summer. Read her reflection here. Kaleah McIlwain was a 2018 Penn Memory Center communications intern.